Twitter is a social networking internet site. People can post messages with up to 140 characters. These can comment on a particular theme identified with a ‘hashtag’, such as #nestlefamily. This hashtag was set up by Nestlé when it invited people who write blogs on parenting to an all-expenses-paid trip to a 5-star hotel in California, complete with celebrity chef. Some turned it down, but 20 agreed to go and began sending ‘tweets’ to Twitter about their journey. Other bloggers began to tweet about Nestlé’s ethical record, including its baby food marketing. When the Nestlé USA Chief Executive turned up at the hotel to make a presentation, the bloggers were primed to put him on the spot about Nestlé marketing and relay the responses. Baby Milk Action became aware of what was happening because of the traffic coming to our sites from links posted to Twitter and we were able to post some key facts in response to Nestlé’s claims. Nestlé started tweeting for a short time, trying to put out the tweetstorm that had disrupted its PR event and offered to take questions. Baby Milk Action suggested a tweet debate, but this was not taken up. 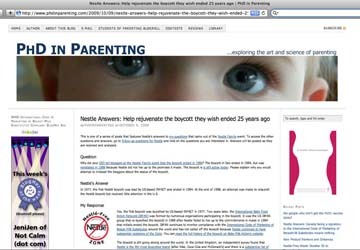 Nestlé soon stopped engaging, but did respond in detail to a list of questions posted on the PhD in Parenting blog (above). These have been analysed on the blog and have fuelled rather than damped down anger at Nestlé’s practices and attempts to justify them. So much so that International Nestlé-Free Week, scheduled for 26 October - 1 November, was taken up as a Halloween boycott in the United States, with articles and boycott lists on blogs and postings on sites such as Facebook and, of course, Twitter. The Nestlé Critics website draws together information from a wide range of experts on Nestlé practices, including exploitation of water resources, trade union busting, child slavery in the cocoa supply chain, treatment of dairy and coffee farmers, spying and so on. 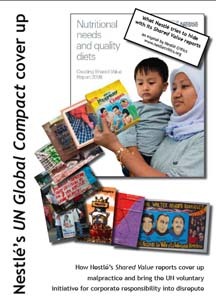 The Nestlé Critics published an exposé of Nestlé’s Creating Shared Value reports and sent this to the office of the UN Global Compact in June 2009. The Global Compact is a voluntary initiative, encouraging businesses to abide by 10 principles and publicising their stated commitment and reports. The reports are not checked nor audited by the Global Compact, even when it participates in launch events, as it has with Nestlé. Nestlé Critics are arguing that Nestlé’s dishonest reports and PR use of the Global Compact bring the initiative into disrepute and have called for Nestlé to be expelled under integrity measures. However, the Global Compact has told us its priority is to promote ‘dialogue’ before acting - ignoring the fact we have been ‘dialoguing’ with Nestlé for decades. (see also page 17).